The hype surrounding the Eagles this year is far different than the hype surrounding them last year. Many fans and experts alike have Super Bowl aspirations for the Eagles this year as they did last year. The difference this year can be seen across the Delaware Valley as fans and experts have tapered their expectations and proceeded with caution when making their picks. You can hear anything from 9-7 to 13-3 when asking people their expectations for the Eagles. Well you can throw all of that out the window as it is finally time to play the games on the field. First up, the Eagles travel to Cleveland to take on the Browns today at 1 pm. Covering the speedy wide receivers will be lightning quick cornerback Joe Haden, who will most likely be on Jackson, and former Eagle and aging cornerback Sheldon Brown. Brown was repeatedly beat by the likes of Mardy Gilyard in their preseason matchup so it will be interesting to see if he can keep up with Maclin. Overall, the Browns had a very strong pass defense last year as they only allowed 185 pass yards per game. On the line former Eagle Juqua Parker and defensive tackle Ahtyba Rubin anchor the defensive line with tackle Phil Taylor out for today’s game. Also out for today is linebacker Scott Fujita. Fujita was originally suspended three games for his part in the Saints bounty scandal but that suspension was lifted on Friday so he was eligible to play today. Browns coach Pat Shurmur did not activate Fujita today. The Browns are the fourth team in the last 44 years to start a rookie quarterback and rookie running back in the first game of the season. Twenty-eight year old quarterback Brandon Weeden, who was a first round draft pick in April’s draft by the Browns, will be under center with former Heisman trophy finalist RB Trent Richardson behind him in the backfield. Weeden, who turns 29 in October, spent time in the Yankees and Dodgers’ minor league system as a pitcher. He is the oldest first round pick in NFL history. He has the size (6’3” 220 lbs) and the arm but he needs work on other areas of being an NFL quarterback. Weeden tends to lock in on receivers and does not look off safeties. Richardson was questionable to start Week 1 after surgery on his knee on August 9th but he is in the starting lineup for the Browns. Tight end Ben Watson is active for today’s game and leading receiver Greg Little is back for the Browns. The Eagles defense has its question marks as they enter the year. Second year defensive coordinator Juan Castillo has a lot to prove as the Philadelphia fanbase is running out of patience waiting for a Super Bowl victory. The Eagles are expected to rotate in six linebackers trying to find the perfect mix. Former Pro-Bowl and Defensive Rookie of the Year LB DeMeco Ryans has been inserted in the middle of the Eagles defense but he is recovery from an Achilles tendon injury. The strength of the defense is, without a doubt, the defensive line. The depth of the Eagles pass rushers is incredible as Trent Cole, Jason Babin, Cullen Jenkins, Fletcher Cox, et al will be chasing down Weeden. The secondary is an area that needs to improve over last year. Cornerback Nnamdi Asomugha looks to return to the former “shutdown corner” role he had in Oakland. One the other side, with the trade of Asante Samuel to Atlanta, Dominique Rodgers-Cromartie is now a starter that allows the Eagles to play press coverage as it is a strength of both Asomugha and Cromartie. The secondary is under a microscope this year because there is no excuse to not be elite. The Browns have one of the most explosive return men in all of football in Josh Cribbs. The Eagles coverage will be important to make sure the Browns are not consistently starting off with good field position. Also, kicker Phil Dawson went 24-for-29 last year so the Browns kicking game isn’t something to scoff at either. On the side, the Eagles look to have two explosive return men as well. Rookie CB Brandon Boykin will take care of the kick returns and rookie WR Demaris Johnson is handling the punt returns. In the preseason, both return men have appeared to be significant upgrades for the Eagles. Kicker Alex Henery was the most accurate rookie kicker in NFL history last season missing just three field goals. However, Henery has missed three of his eight field goals in the preseason but nothing to be alarmed about, yet. 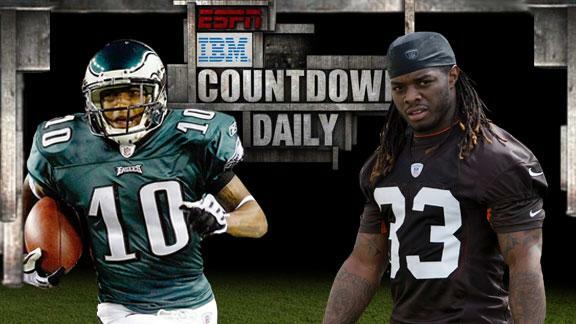 Overall, the Eagles have a lot to prove this year and the Browns seem to be rebuilding again. The Eagles weapons appear to be healthy and ready to prove to everyone that 2011 was an aberration. I think the Eagles take it to the Browns this afternoon.